We are on of a small few who are authorised by DOC (Department of Conservation) as a licensed operator on the Whanganui River. Our guided canoe trips are suited to large groups, company retreats or team building events as well as the first timer in a Canadian Canoe. 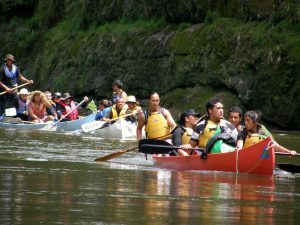 We also offer canoe accommodation and transport to and from the Whanganui River. We currently have a FREE Accommodation offer available for Canoeists only, conditions apply. If you have been canoeing before and happy to make your own way down the Whanganui River we can help out with canoe hire. We also have a Free Accommodation offer for canoeists, conditions apply.